Choosing your wedding DJ is the best part of your wedding preparations. You get to meet a lot of wedding industry people who are generally nice, outgoing, and personable. Of course the big debate is DJ or Band. That’s always one of the hard decisions a newlywed couple must make. The biggest advantage a wedding DJ has over a band is cost. There are some lousy bands out there and many awesome bands too, but many bands can cost a lot of money. I saw an excellent band at a function that charged $4000 for the 8 member group. Band Or DJ? That is the question! Here on BridalTips.com we focus on DJs. Don’t hire a band you can’t see or hear first either at a function from someone you know perhaps, that you just happen to attend, or view for a few minutes on a video. People tend to get married within a year of their friends, and may see their future wedding vendors at work on other weddings. Remember, the bands need to take breaks, so they play only a few 15-20 minute sets. But this article is about DJ’s. We chose a wedding disc jockey due to cost, and we did not have to worry about a marginal singer crooning our favorite songs out of tune, which we see a lot of here in Florida. Just because one person is a good singer in a good band, does not mean the rest of the world is. Anyone who plays in a band has seen their share of awful bands. And when a consumer advocate like me tries to point out both sides of the coin to consumers, the losers come out of woodwork to complain how useless I am. Those are the people you need to avoid. But I suspect that you’ll have the least amount of problems with your DJ than any other vendor, because the vast majority of DJs are great. I’ve been to maybe 12 weddings in my life and 3 of those 12 weddings (25%) I thought the wedding disc jockey stunk. Many other guests at these weddings back me up about wedding DJs. 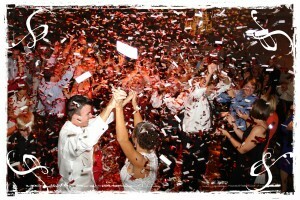 A good wedding DJ is cheaper than bands, and they dynamically work your wedding crowd for 4 hours. In rare cases a band might party hardy then decide they don’t want to show up. This probably happens more than a DJ not showing up. This is why you should use contracts. If they refuse to use one, then you should refuse to use their services. Bands always arrived late at my friend’s recording studio. And before any musicians get all indignant, it happened at my sister’s wedding. She hired a highly recommended harpist who was out getting drunk when she should have been at the wedding. Luckily I had brought a wedding CD as backup, the catering manager brought out a CD player, and we had music for me to walk her up the aisle with. So it does happen. Feedback Alert! What Causes that loud shrieking feedback? Sounds easy on paper, but man, what a difficult concept for some DJs to grasp! Some bands can’t grasp this simple concept and often the result is ear piercing feedback. They look around startled like they never heard feedback before, and the singer is standing with the microphone only one foot away from the speaker wondering what the cause is. We were at a wedding and the band produced feedback half a dozen times. Good wedding DJs and bands never produce feedback. “Starving artist” musicians usually cannot afford decent PA systems which result in the lead singer not being heard properly feedback. Wedding guests hate this. Your best resource in finding your wedding DJ is people you know. Ask around, try locally famous DJs from radio stations. Some people moonlight as wedding disc jockeys and are good at it. Talk to recent newlyweds, ask your wedding reception hotel or resort, they may have a list of preferred vendors for you to call, wedding DJs whom they trust. They also see the horror stories and know who to avoid. This list contains vendors that the resort has worked with and knows to be reliable and professional. The resort’s reputation is stake also. But beware of secondary hotels or reception sites that might not be as scrupulous. Some caterers may get a kickback, so know who you are dealing with. Our DJ was recommended to us by the catering manager at the Boca Raton Resort where we had our reception. Our DJ also worked her wedding, and she oversees many weddings every year so she knew who the right DJ was, and boy was she right! Don’t rush to pick your wedding DJ, they all have different personalities. Ask to see videos from previous weddings so you can view a few minutes of their work. Remember that using computer software, a DJ can edit their best material to make themselves look much better than they are. But at least you cans see them in action. Give more weight to personal recommendations. Scrutinize wedding videos from friends to see if you like their DJ. If you happen to see your potential DJ while you are a guest at another wedding before you make your decision, that helps too. Many people of marrying age attend several weddings in a year, and this is a good time to start scoping your vendors. If you have special song requests, ask the DJ if they have it or if they can get it. If your reception is complex, and in a big well known resort or hotel you want a true professional who works in the big places, not someone who travels the condo clubhouse circuit. Many DJ’s may get offended by this, but you really want someone with the experience of working with the catering departments of these larger venues. This synergy between DJ and catering manager is what keeps your function running smoothly. A DJ’s talent should reach far beyond just motivating the crowd or making the announcements at the right time. They must have their finger on the pulse of your wedding and know everything that is going on. The only way this can happen is when they have a good working relationship with the venue staff. Is the DJ familiar with your wedding venue? Ask your DJ if they have done weddings at your reception site before. It helps that they know the wedding venue, how to get there, and they have a familiarity with the staff. Your wedding disc jockey may also be better prepared to deal with known issues or caveats with the wedding reception hall. Every little positive wedding DJ bullet item you find makes it less likely that you will have problems with your DJ. It does not mean you should reject the DJ if they have not been there before, but it’s a nod in their favor. This one is important. You would hate to spend an hour interviewing your wedding DJ and like their personality, only to be blindsided at your wedding by having another DJ show up, when you expected the DJ that you interviewed. Make absolutely certain your contract spells out exactly who will be your DJ. If you want the owner and not their employee it should be on the contract. The contract should also mention what time and place they are supposed to be. Call a month ahead of the wedding to verify. Nay verbal promises made by your wedding DJ should be in writing on the contract. They won’t remember several months from now what they verbally promised you today. What about wedding DJ overtime, and other unexpected or hidden fees? Your contract should clearly specify all costs including any assistant disc jockeys they will have with them, as well as special equipment lighting packages, or other fees that they pass on to you the client. Be wary of vendors who give you low ball quotes, but only give you 3 hours of time. If your reception runs longer, you find out “it’s another $200 per hour or we walk out right now”. You must also plan for overtime in case the reception runs longer than the contract specifies. The contract should clearly spell out how much extra it will cost you to have your wedding DJ for an extra hour or 2. It can cost $150 or more. Do not believe verbal promises stating they will work extra hours for free. Put it in writing in the contract, or they will not do it. Don’t be blindsided like many brides and grooms are when there event runs over. I receive complaints from brides whose wedding ran over, and the DJ threatened to leave if not paid in cash right now. You don’t want surprises, your wedding DJ contract should be a game plan that covers all bases so you know exactly how much your DJ will cost you. What attire will your wedding disc jockey wear at your wedding? Sounds like a no brainer, but you usually want your DJ to wear a tuxedo. The DJ at my brother’s wedding was wearing black jeans and a shirt that was hanging out. He was supposed to be wearing a tuxedo. Even the photographer went up to him and chastised him. How many years experience does this wedding DJ have? Will they play CD’s you provide? Some wedding disc jockey folks have a list of songs they play and except for the bride and groom first dance, do not give you much choice. Our wedding DJ to allowed us to choose at least 50% which is not the norm. Let your DJ be your guide as to what songs should be played. A good disc jockey reads the crowd and knows what to play. Be sure they know what NOT to play, as well as special songs you want to hear. Ask if they will accept requests from wedding guests. Your wedding disc jockey should be flexible with a wide selection, so requests from your wedding guests can be fulfilled. This step is VERY crucial, because your wedding DJ plays about 60 songs during your reception, and you want nothing but the best tunes to keep your dance floor crowded. If the DJ needs to intervene and suggest a song, heed them as they generally know what they are doing and keep up with the current trends. You want a wedding DJ who can adapt to any crowd. This DJ will be someone who is very well versed in all areas music. Don’t try to give the DJ a tape or a list of 100% of the songs to play for the night. You hired a DJ not a juke box operator. If they stick to your play list, I can guarantee you’ll have an empty dance floor. Your musical taste is not the same as 120 people at your wedding. Let your DJ do their job and keep your wedding guests happy. Where will your wedding DJ setup? Is there a dance floor? This is a rare need, but some wedding reception sites require your wedding DJ to bring a dance floor if the room does not have one. Some hotel banquet halls are all carpeted, without a hard floor for dancing. Also, you MAY not want a DJ who comes in and elevates themselves on the stage. We liked our wedding DJ’s philosophy that the DJ should NEVER overshadow the bride and groom and he did NOT want to be up on the stage. Rather, he setup off the right closer to the crowd. 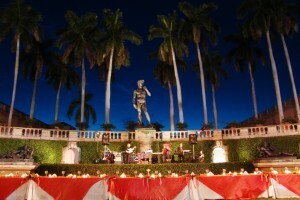 Bucking tradition at the Boca Resort, we put our bridal party head table up on the stage. This allowed more space in the room for the guests, and ALL of them could see us. Will your wedding disc jockey need to be fed at your wedding? Be sure to feed your DJ, with travel, setup, performance, tear-down and return travel, they often go 10 or 12 hours without eating Ask if they want to be fed. Some disc jockeys want food, some do not want to eat while they work. They deserve it though, because they might be there 4 hours with nothing to eat or drink. The caterer needs to know so they can bill you accordingly. They usually make sandwiches for the DJ’s, musicians, photographers, etc., or you can just let them eat off your buffet. Verify pricing with the caterer, you would not want them to charge you $150 per head for a DJ and an assistant disc jockey. The DJ at our wedding refused to be served food, don’t know why. He felt we spent enough money and should not have to spend more to feed the DJ, so he eats before the wedding. He also felt it was unprofessional for the DJ to be eating when they should be working. We really admired his philosophy on this topic, but it’s still ok to feed them, they’ll be there 4 hours or more plus setup time. The hotel would have charged $18 for his food. We could not even get him to take a Coke. It’s always nice to feed your vendors. We even gave him some chocolate and a centerpiece to take home to his wife after the reception. Does your wedding DJ have a request form for you to fill out? Ask for a list of wedding requests and suggestions in all categories. Some wedding DJs have a request form for you to fill out, so they can have everything ready for the wedding. Some obscure songs can take a while for them to obtain. Does your wedding DJ do corporate functions also? Ask the DJ if they ever do corporate functions, and view sample videos. If you can find a talented wedding DJ who has experience in corporate functions, then you really have someone worth their weight in gold. These are true professionals with mastery of dealing with large scale projects and all the SNAFUs that go along with them. The DJ we chose does numerous corporate functions in addition to being an excellent wedding DJ, and companies have paid to fly him all over the place. If you are a wedding DJ, this is a good selling point. Not a deal maker, but impressive, and it’s ok to use a DJ that does not do corporate work. What problems has the DJ encountered at weddings and how did they solve them? You want a wedding DJ who is resilient, able to respond quickly to unforeseen mishaps that can mar your wedding. You can bet that many weddings look smooth, but had issues that were quickly seamlessly patched behind the scenes by DJs, caterers, and other vendors. Are you insured or belong to any professional organizations like A.D.J.A? Your contract only states what your DJ will do, but it does not say if they will do it well. Membership in organizations like A.D.J.A. gives them growth, education, and ethics. How Much Do Wedding DJs cost? The best thing about wedding DJs is you can find a DJ to fit your budget, from casual guys who moonlight on parties, all the way up to professional wedding and corporate types. There are moonlighting DJ’s that might only charge $300. You’ll find DJ’s charge $400 up to $1900 depending on the area. Your area may be less or more. In San Diego for example, you might expect to pay in the $1300 for a true professional top notch wedding DJ, and no fancy lighting. In 1996 in Boca Raton, FL, our DJ’s employees charged $500. But we chose the owner, who was $750 and the price might be higher by now. Our DJ charged a bit more than most local DJ’s, as he is very much in demand and highly recommended by several of our vendors. That’s a great way to find vendors also. When several different wedding vendors point to the same person as the best, they are usually right. Our wedding DJ more than proved he was worth his weight in gold, as the evening went flawless, not one incidence of feedback, and the wireless headphone mic never gave out on him. Friends of mine several years ago had a local famous radio station DJ do their wedding too, that was pretty cool. Let the DJ ask you questions too like what you do or don’t want to hear. You want someone who takes an interest in what YOU want. We also met with the DJ one last time a few days before the wedding where he phonetically pronounced each person’s name he was going to introduce at the wedding. This is a great added touch because no one likes to have their name mispronounced at a wedding. You may want to hire the owner of the DJ company, like we did, even though they usually charge more than the employees. The owner usually is the smartest one and has the most experience. No Business Cards On Display! Note: We get a lot of angry emails here on BridalTips.com from wedding disc jockeys about this who arrogantly tell us “how very wrong you are!). They forget the basic rule of business that the customer is right. If the customer does not want you to put cards out, then honor their request and don’t do it. Keep them in your pocket. If the customer does not mind, then you can put the cards out. We were at a wedding where the DJ had several different vendors’ business cards sprawled out on top a speaker, and it made the place look like a flea market. If anyone wants the DJ’s card, they can ask for one. All DJs carry cards in their pocket. Your reception is not a community bulletin board. All DJs take note: In our opinion, this is one of the tackiest things DJs do. Many guests at weddings we attended agree. This was the first thing we demanded but of course our DJ did not condone this activity either. I’ve had a few DJ’s who chastise me for this view, and they claim this is acceptable, as people don’t want to interrupt a DJ for their card. This will always be a controversial issue, but let me just point out that our DJ does not believe in putting business cards out. It all depends on your comfort factor. Everyone I asked about this disagrees with the DJs who send us the letters telling us how wrong we are on this subject, and some of them are down right rude and arrogant about it. OK so we are wrong and all our friends are wrong, and all our co workers are wrong, and we are the customers who don’t really know what we want, and we are all just wrong? Give me a break. See this light off to the left? You don’t want it at your wedding. Or maybe you do, if you want that police raid look at your wedding, it’s your decision. This is just OUR opinion, but this is on the Tacky Top Ten, a cheap way for the DJ to give off a lot of light on a budget. Not Enough Good Music Selection! We attended a wedding where my own 430 CDs were more than the DJ’s! I know, he may only play 60 songs the whole night, so how many CD’s does he need? Apparently he did not have the standard songs that guests were requesting, nor could he read the crowd to play the songs that would keep them dancing. At one wedding the DJ really played some old dried out useless songs, and did not have half the songs people requested. The quality is more important than the quantity. Most DJ’s use many compilation CD’s and order through a record pool buying service These compilations are great cost effective ways for DJ’s to buy all the hits. Why spend $12.00 on a CD with 1 or 2 hits when you can spend $12.00 on a CD with 20 hits? The problem with the DJ at my friend’s wedding was he had about 100 regular CD’s, so I would have to fish through 10 of them to find 2 decent hits that I thought the crowd might enjoy. This DJ and his setup were not even facing the dance floor!! Could anyone be more stupid! He spent most of the time with his back to the dance floor (his equipment was facing the back wall) flipping through his small collection of CDs for the next song when he should have been reading the crowd. He even played several songs more than once! Then he complained to me that no one was out there dancing. Gee, I think we’re going to have to book time on the Pentagon’s Cray III computer to figure this one out. Obviously the DJ did not determine ahead of time what musical preferences would be, nor did he read the crowd properly. So no wonder the dance floor was empty. The same aforementioned DJ asked me to pick a few songs from his collection to get the crowd going, which I did. He lacked 2 songs that several guests asked to hear, which every DJ should have. Also, he did such a poor job wiring his Karaoke monitor, that he had to fiddle with it a many times during the reception, and finally gave up. No more Karaoke. He hardly ever got on the mic to motivate anyone to dance either. It seemed like he was there to just queue up CD’s and nothing else. Heck I’d have done that for free and saved my friend the money and aggravation. The bride was upset after the wedding about this. No wonder the DJ complained to me there was no one on the dance floor. We had to choose a couple of tunes for him which DID fill the dance floor. If the DJ is not constantly motivating the crowd, the floor will be empty, and your reception will be a bust. It’s like a strange quiet party. You need constant motivation from an experienced crowd pleaser. This same DJ did not even help us during the Macarena (it was THE dance back then, what can I say). At our wedding, the DJ and assistant both showed us the moves so we did not all crash into each other and abandon the floor like my friend’s wedding. After the wedding the bride expressed her anguish, shaking her head, saying this guy came highly recommended. Keep in mind this is the exception, not the norm. If you are a worshipper of the Lord, you may ask that none of the songs have any offensive lyrics. You’d hate to be there with your pastor and congregation members when the Divinyls song “I Touch Myself” comes on. The DJ at my brother’s wedding really screwed things up. He was so highly recommended by everyone and my brother was at a loss for words trying to figure out how everything went south on him. The DJ did not play the songs he was supposed to play. He missed the song for the Bride & Dad dance! What a big mistake. During the Groom & Mom dance, the groom and mom were kept waiting alone on the empty dance floor for 5 minutes because the wedding disc jockey could not get his player to work. Let’s see I think you just push the one that says “play”…. Most DJ’s are excellent, but you can see the importance of a little due diligence ahead of time. Try to see them at a function first or on video. DJ’s Should Know The Itinerary at your wedding reception! It is the DJ’s responsibility to know when all the events are supposed to occur during reception, like cake cutting, bouquet tosses, birthday surprises, etc. The DJ we mentioned in the preceding paragraph did not know when anything was being done. Around cake cutting time, I asked him when it was going to occur and he had no clue. The DJ’s job is to work with catering, and know when meals are being served and when the milestone events are to take place. NOBODY in the whole wedding knew when anything was happening so it was somewhat confusing. The DJ and the caterer should have this under control before your reception begins! The DJ, caterer, and Photographer should all be in contact and playing off the same sheet of music. Cordless Mics Are a Plus! I’m sure some DJ’s will gripe at me for this, but the microphone chord is a safety hazard, and it is restricting, although some venues you cannot get out of using cords, due to interference issues. A wireless microphone system, if properly setup and sound checked, and stocked with a redundant backup with batteries, should work out just fine. Sure there’s headaches associated with wireless systems, such as interference on the same frequency, and some reception halls, cordless just won’t work no matter how hard they try. But testing and redundancy is the key. We had no problems at all during our 4 hour reception, and our DJ used only a wireless headset the whole evening. This is not a requirement, just a preference. Many fine DJ’s are still using corded microphones. Remember, some areas you just cannot use wireless microphone due to local interference. Avoid wireless lapel microphones. For outdoor weddings they are useless, suffering from poor performance and wind noise. What about Chicken Dance, or Hokey Pokey? Some people love it, some people hate it. The consensus among our friends and numerous coworkers is that we made the right choice in NOT allowing it in our wedding. I believe these songs are outlawed in fifteen states now, anyway. Just kidding. Most guests feel Uncomfortable doing these cheesy dances. I even felt uncomfortable doing the Macarena. But it’s your wedding, and you might want to hear them, that’s fine too. But the point is let the wedding disc jockey know your preference. If you hate these songs, you would hate to be surprised by your DJ playing them at the reception. Group effort songs (i.e. the old “Electric Slide” always fills the floor. The Macarena and the Electric Slide became popular in their day because people who can’t dance will usually get up and dance to a group activity song. A good conga line will always fill the floor. Each group of people is different. I polled several friends, coworkers, and wedding guests of other weddings we attended, and it was unanimous: No Chicken Dance, it belongs at Oktoberfest, not a wedding. But then many DJs email us to say that it’s a favorite crowd pleaser at many weddings they do. Your group of people might have the best time in the world with it, but it’s your decision. Everyone overlooks this, but it is an important factor when choosing your DJ. You are paying money for a professional and they better know their equipment. Ask them what speakers and amps they use. The better speaker brand names are Mackie, JBL and Electrovoice (with the “EV” on the speaker). Some DJs use Rane for their mixer. But this is not an exhaustive list, there are other good names as well. This is another reason why you asked the DJ if they do corporate affairs, because they may use the same high end audio equipment at your wedding. You don’t want them using home stereo amplifiers and speakers because they will fail under the volume of use. We were at a wedding once and could not hear the DJ announcing the bridal party because the volume was too low and it was muffled, all base and hardly any treble. This DJ did not test the acoustics of the room with a simple sound check before they started. Can you say…. Equalizer? This is why they must have good equipment, and know how to set it up. A DJ with a wireless headset is a plus. With the headset mic, the element is always right in front of the DJ’s mouth, and the gain need not be set as high as a handheld microphone. Thus the headset is less likely to cause feedback, and if they place the antenna properly, there won’t be any noise or interference. Also the DJ can easily roam around hands free, or even blend in with the crowd during group effort dances. If a DJ tells you wireless mics don’t work, or give excuses why they don’t work, it’s because they either used cheap equipment, did not want to spend the money, or simply did not know how to properly setup tricky setup wireless mics. They can be difficult to setup. I’ve been to dozens of concerts with wireless mics and never saw a problem. Used properly, these units are great tools of the trade. On the other hand, I’ve seen DJs walk around swinging the mic, not noticing they are about to step into the Twilight Zone in front of the speaker and violate Jeff’s Law of Wedding Acoustics mentioned earlier. Then, a loud shrill of feedback fills the room. Lighting is another thing to consider. Can your DJ get additional lighting? Some people want it, some could care less if they want to save money. But we wanted to put on a show they would remember. If you want state of the art lighting, some of the bigger DJ companies can master this for you very easily. Again, this is where DJs with corporate event experience really excel. They usually have the top notch lighting, not old cheesy disco balls with 2 glorified lawn lights. We did go a little overboard, spending $800 on an intelligent lighting system consisting of 4 intelligent units and 2 sound activated gobos. Man what a show that was. The ballroom was FILLED with light. Many guests told us it looked like a rock concert, with numerous beams everywhere. And this did not upset the older crowd either, which was a worry of mine. We were pleasantly surprised to see many of them out there dancing the new tunes with us. This may not be for all of you, but if you have the means, go for it. Our wedding video looks like Soul Train. I was surprised that our DJ tried to talk us out of this package, stating corporations are the typical customer. But more and more “consumer” affairs are going this way. Wedding Contract: The contract should clearly state WHO will be your wedding DJ. If it is the owner, you want their name on your contract, with no switches allowed. You spent time interviewing the owner and you want that DJ listed. Be wary if they try to leave the name off, there could be a bait and switch. If they are using an assistant, make them itemize that as well. Did you agree to rent any additional lighting through your DJ? Better have that on there too. Your contract should list what type of standard lighting you are getting as well. Also have them list what their overtime charge is in case you decide to run late. You don’t want any surprises there. Make sure all correct dates, times, address, phone numbers, and deposits are listed. So what was our final package? We had the owner for 4 hours at $750, plus $850 for the computerized lighting. This also included an assistant, which is a great thing for a DJ to have. I know we went overboard, but what a show. It was still cheaper than the bands we looked at. One band was $12000! We ended up keeping the DJ for an extra hour and paid another $150, which was already stated in the contract. Sure this seems steep, and yes we could have done just the bare bones package, but it was a typical wedding for professional working people like my wife and I. This is not necessarily the way to go if you are trying to save money. Remember though, you get what you pay for. We got more than what we paid for. How many weddings were you at where several guests commented it was the best DJ they’ve ever seen? Our wedding was like that. There are plenty of inexpensive DJs out there who will give you a wonderful evening. Some of you may not want all the glitz and flash we had. Some of you will be happy with an informal DJ who DOES do the condo or bar circuit. We just wanted to shed the light on it and abuse our First Amendment rights by stating many of our opinions on certain subjects. We did find the DJs however, to be the easiest of all the wedding industry people to work with. And you don’t have to spend $1600! Just have fun picking your wedding disc jockey.